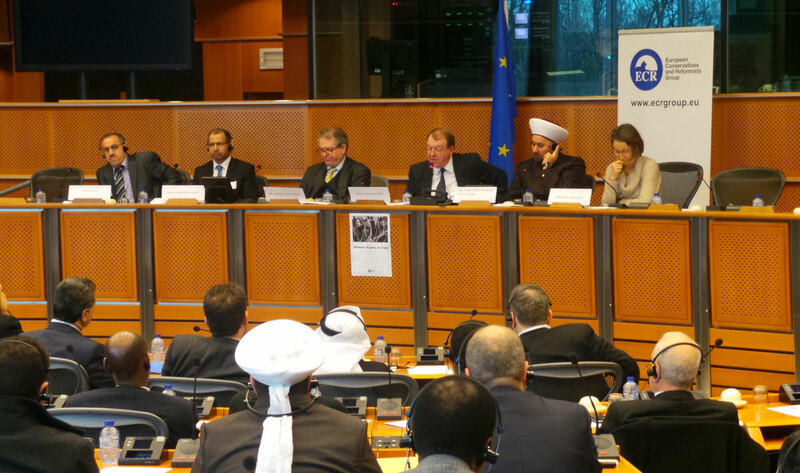 A high-level conference involving some of the most prominent political and religious leaders in Iraq, was held in the European Parliament, Brussels, on Wednesday 19th February. Organised and chaired by Struan Stevenson, MEP, President of the European Parliament’s Delegation for Relations with Iraq, the conference focused on human rights in Iraq and featured speeches from Sheik Dr Rafe Al Refaei – Grand Mufti of Iraq, Saleem Abdullah Al-Jabori – Chair of the HR Committee in the Council of Representatives, Haidar Mulla – Member of the Iraqi Council of Representatives, Minister Falah Mustafa Bakir – KRG Head of Department of Foreign Relations, Yonadam Kanna – Chair of the Labour and Social Affairs Committee in the Iraqi Council of Representatives, Kamel Zozo – Syriac Assyrian Chaldean Movement, Elisabetta Zamparutti – ‘Hands Off Cain’ NGO, Btrus Sliwa – Head of the KRG’s Independent Human Rights Board, Dr Abdul- Razzaq Rahim al- Shemmeri- Spokesman for the Herak Delegation from Al Anbar Governorate, Dr Sabah Al-Mukhtar – President of the Arab Lawyers Union, UK, Dr Mohammad Taha Hamdoon, Spokesman of the Popular Movement in Iraq, Dr Moneir Hashm Al-Aobyde, Spokesman for the Movement of Baghdad and many others. The eminent speakers were welcomed by Dr. Charles Tannock MEP, Foreign Affairs Spokesman for the ECR Group. Many Iraqi guests had travelled to Brussels to participate in the conference, which follows the publication of a highly critical report on Iraq by the European Parliament’s Directorate-General for External Policies – entitled “Iraq’s deadly spiral towards a civil war”. A resolution condemning the on-going violence and abuse of human rights in Iraq is also under preparation in the European Parliament and will be debated in Strasbourg next Wednesday, 26th February. The draft resolution refers repeatedly to the damning report on the abuse of women in Iraq published recently by Human Rights Watch. “Last November, I was in Iraq. I met with many leading politicians, religious leaders and with courageous men and women who had led popular uprisings and protests in Al Anbar and 6 provinces of Iraq and in many Iraqi cities. The message from all of them was identical. They told me that lawlessness, terrorism, corruption and the systematic abuse of human rights are each a daily feature of life in Iraq. They told me that Prime Minister Nouri al-Maliki is rapidly becoming another Saddam Hussein and that modern Iraq is a dust bowl of violence and bloodshed. More than 9,500 people died last year in bomb attacks and assassinations in an increasingly ugly insurgency that threatens to take the country back to the civil war that erupted from 2006-2008. Over 1000 have died already this year. “It was these same people, people from different ethnic backgrounds, from different faiths and creeds, but who share a desire to see freedom, democracy, justice and peace restored to their country, who urged me to organise today’s conference, so that they could come to the European Parliament and reveal the truth about Iraq to the West. I am deeply grateful to them and thank them for the expense, effort and courage they have expended to come here today. “They told us in graphic detail how Maliki is using the Iraqi military in a genocidal campaign of ethnic cleansing against the Sunni population of Ramadi and Fallujah, aided and abetted by a generous supply of missiles, rockets, drones and other weaponry from the US, which he uses to slaughter his own people, on the pretext that they are terrorists. The US has even decided to sell and rent Maliki Apache helicopters which he will use to massacre men, women and children in Al Anbar. It is an outrage. “I am also appalled at the treatment of the 3000 refugees in Camp Liberty who are incarcerated in prison-like conditions and where the Iraqis are even restricting supplies of food and preventing emptying of sewage tanks, causing the camp to flood with polluted sewerage water and risking health. These defenceless people have been repeatedly attacked by Maliki’s forces, including the horrific massacre of 52 of their colleagues in Camp Ashraf last September, when 7 hostages were seized, 6 of whom are women and nothing has been heard from them since. The limp-wristed response from the west has simply encouraged further atrocities of this kind. “It is time the West woke up to the tragedy of Iraq. It was the US and the UK – George W. Bush and Tony Blair – who invaded Iraq and overthrew Saddam, declaring: “Mission accomplished”. They boasted that they had left behind “a functioning democracy”, when in fact they left behind a basket case. It was the US who colluded with Iran to return Maliki to power after the last election, even although he had lost that election by 2 seats. Now, in breach of the Erbil Agreement, Maliki has retained control over the Defence, Intelligence and Interior Ministries in his own office and he has even created new, independent security 6 intelligence organisation that is answerable only to him, giving him despotic powers. Dr Sabah al-Mukhtar – UN Permanent Representative, Arab lawyers Union, said: “Sending foreign troops to spread democracy turns the concept upside down. HR abuses occur in every country, but Iraq has a unique situation. Maliki abuses all of the human rights of all of the people, all of the time. Iraq is also bottom of the transparency international list of corrupt states, behind even Somalia and Sudan. Why did the Americans liberate Iraq and then hand it over to the mullahs in Iran?